I received my new griddlemaster griddle top this past Friday. Cleaned and seasoned on Saturday, and cooked two different meals on Sunday. I could not be happier with this product. The design and overall quality is remarkable. I have always wanted a flat top grill and after seeing your videos on YouTube I immediately ordered one. I just wanted to thank you for an awesome product! I have been talking about it non-stop with friends family and co-workers and they are all interested in getting one. I received my griddle with the bottom already spray painted. I cleaned the top with Simple Green as you suggested. Took me all of 10 minutes just to make sure the oil was off from the top. Placed it on top of my Member’s Mark grill…..perfect fit! I was amazed at how heavy and sturdy the griddle was. I followed your instructions on seasoning it with very little olive oil. I did it 10 times “just to make sure”. I made pancakes, eggs sunny side up, and bacon for breakfast, bacon wrapped hot dogs with grilled peppers and onions for dinner. Clean up is easy as you say. A simple scrape to one corner, scoop up the grease with the spatula, wipe, and re-oil. EASY! Next day, same breakfast (family loved it), made carne asada and chorizo tacos for dinner. Awesome!!!!!! Again, easy clean up. I’m glad I found your website and I’m very glad I bought your griddle! The griddle does bow just a little bit but not enough to be a concern but it’s also brand new. I’m sure it won’t anymore after a good 10-15 uses (which will be very soon). Keep up the good work, GM Joe!!!!!!!!!!!!!! 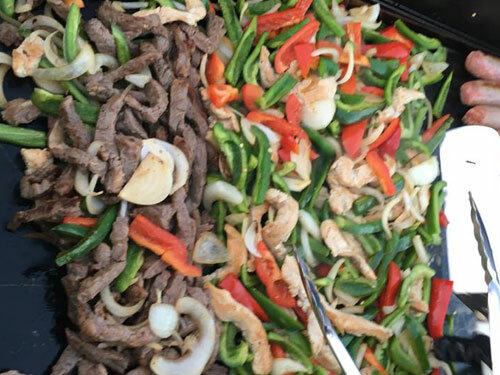 Wanted to let you know that we fired up the grill with the Griddle Master on Wednesday and Matthew cooked some fried rice, bourbon salmon, shrimp and hamburgers. All went quite well and Matthew I think enjoyed the experience (would have enjoyed it more if it wasn’t 30 deg and dark). Clean-up was quick and I was surprised just how robust the black layer (seasoning) is when scraped. Received my second griddle last Friday! LOVE IT!!! Already cooked several meals on it and I don’t know if I’ll ever use the grates again! Thank you for your help!!! Love your videos. I’m getting a new griddle soon, and watching you cook has got me incredibly excited to try some new recipes. Every now and then I get a email notice that I do a double take on. 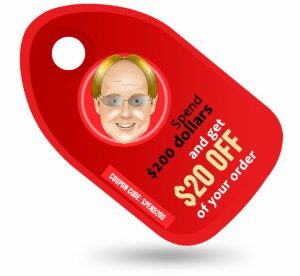 After checking out your website, that’s what I did! Just spent two hours watching your videos learning how to measure, install, season, etc. your griddle. I have to admit, I am quite impressed. Just took my Griddlemaster griddle to Daytona international speedway. Griddlemaster was the talk of the infield at Daytona international speedway. I can’t tell you how much I love my griddle master griddle! 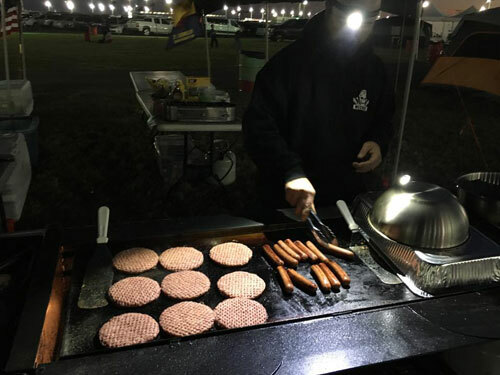 I did all the cooking for our cub-scout pack event at Daytona. They were all amazed at how much food that thing makes. As a result one of my friends Doug Hepling who helped me cook is buying one for his grill. My only regret is that I don’t have time to cook on it every day. I have 5 kids and routinely (2-3×/week) have guests over (10-55 total people per visit), and thus needed something to make amazing food and for the masses, so that our friends and family keep coming back. Watching your video on seasoning the griddle, I didn’t understand how critical it is to get THIN coatings of oil on the griddle when seasoning, and am now having to re-season it the right way after screwing it up. My bad. My griddle, bought July 2016 is too tall for my grill to close, which is key for rain storms and for transporting it (baseball games, parties at other friends houses, etc). I really wish it would close all the way, but you did mention over the phone that future orders would fit, so future buyers get theirs to fit. 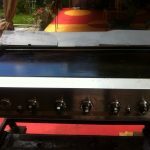 Ordered your griddle top last year for my sams club event grill. Superb quality and build. I can really feed the crowds now. I will be ordering more custom made griddles in the future for my other burners and grills. Hey Joe- thanks so much for rushing my griddle top for our church Father/Daughter dance, breakfast for supper was the menu. I emailed you on Monday night, I had the top Thursday and cooked pancakes, French Toast, bacon and sausage on our Bakers and Chef’s grill with that fitted top. Took about hour and a half and we fed 140. Just rolled 100 hot dogs this afternoon for Fall Festival so favorite new cooking tool! Excellent product and value. Hey Joe – hope not annoying too much. Son works at Steak n Shake and knocked out our supper tonight on new top after I seasoned. Weasel popped off best burgers we ever had in this house. I’m so excited to have found your product! This will be the way I do burgers at church/etc here on. I’ll send you some biz, perfect purchase thanks again! Hi Joe. My griddle top arrived today and is a perfect fit! I will begin the seasoning process tonight. Thanks again for your excellent customer service! Just holding the griddle in my hands tells me it’s a great product. Love the griddle top! Performs perfectly and we”re griddlin’ fresh shrimp and scallops for lunch today with vegetables and fried rice. Clean up is a snap once you have all your “gear” close by. I can have it cleaned and ready for the next use before a glass of wine is poured! Thanks for a great product. This looks fantastic. I’m gonna order one for my Sams Club event grill. 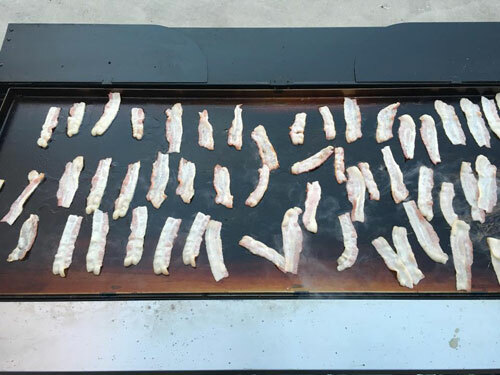 @Griddle Master, you should join the Sams Club 8 Burner Event Grill Group here on FB and let everyone know about this awesome griddle. Just ordered my griddle top today for my Bakers & Chefs grill can’t wait to get it. Made all the necessary modifications already just waiting for it to come. I know I’m going to live it cause I’m a big BBQ cook. Got my top in as stated, VERY well packed, fit perfect!! Seasoning it now!!! Can’t wait to start cooking some fun meals!! Thanks so much!